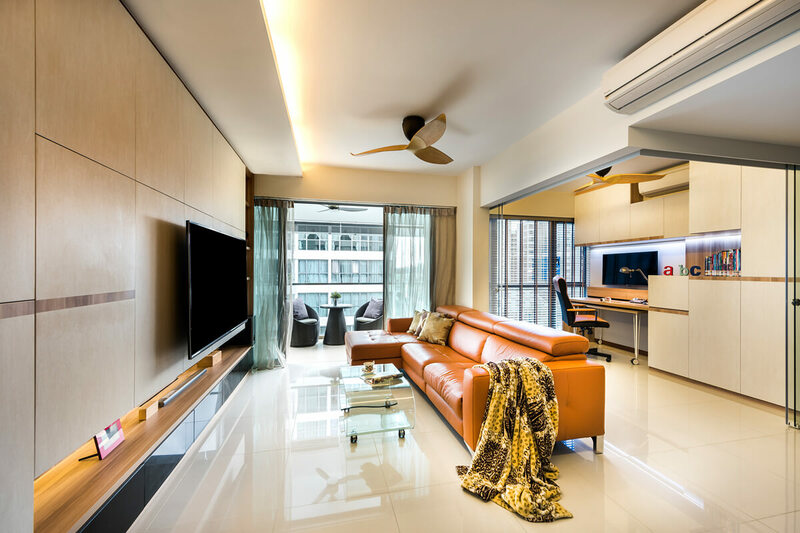 A large 5 bedroom HDB BTO home owned by a young couple, The Skyline was designed as a testament to classics in a contemporary context. Moody dark greys and dark tinted mirrors were used to add drama, with carefully considered lighting visually separating functional areas. A bar and library area were effortlessly included in the living space, adding character to the home. 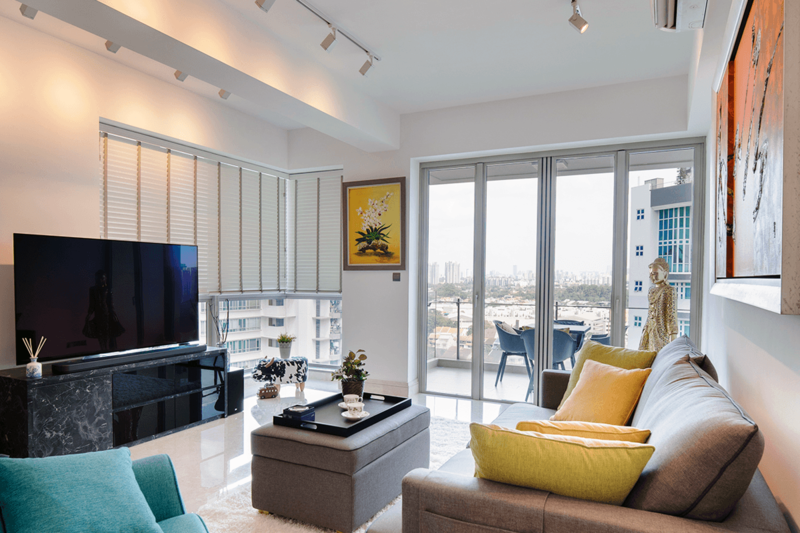 Home guide began the project by identifying the different elements that were to be included in the open living space and then defining each area with a clever use of screens and lighting. 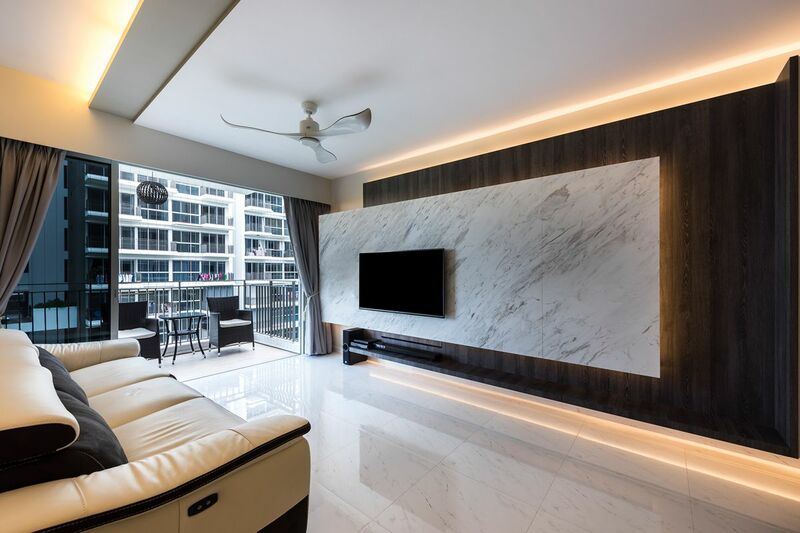 Every HDB home interior design that we have completed each have their own characteristics and definition of what makes them extraordinary. 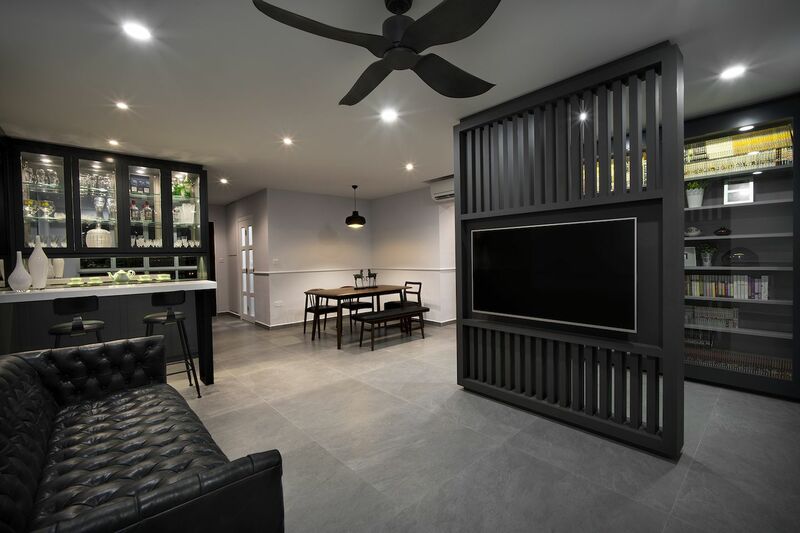 The success of this particular project lies in the use of dark finishes throughout, creating a classic visual language coupled with simple modern lines and materials. A library area was created which displays an impressive book collection, while the bar cabinets glitter with crystal and liquor bottles glinting behind their doors like intriguing jewels. 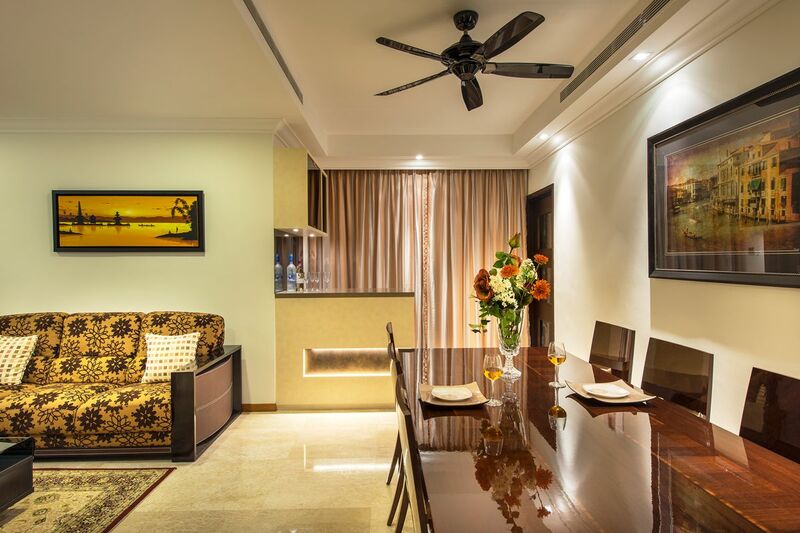 The living room is dominated by the custom designed partition and classic chesterfield sofa. 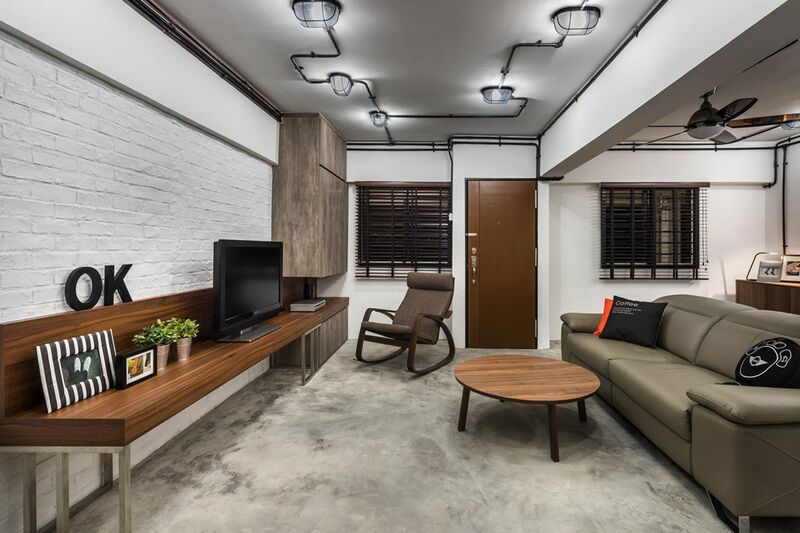 The partition, in dark timber, houses the flat screen TV and also separates the library from the rest of the space. Linear slats in the partition not only maintains visual openness of the entire living area, it also allows for glimpses of the shelves behind, encouraging guests to explore further. 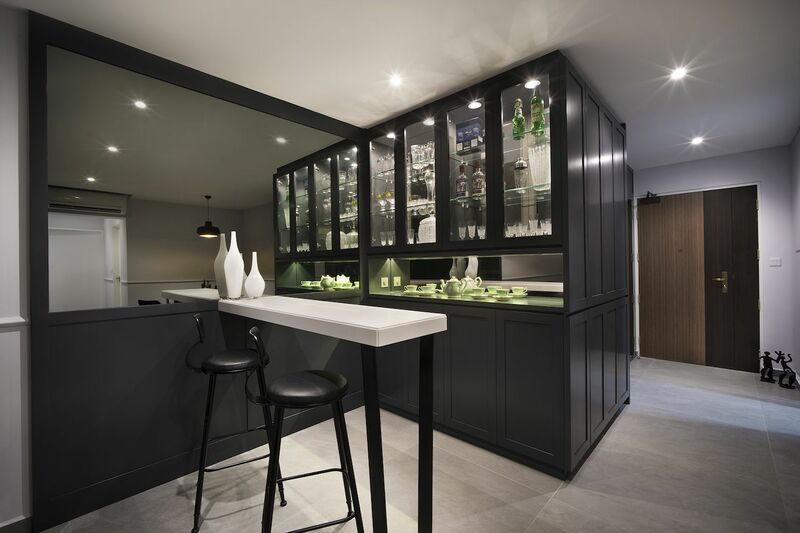 The bar area glistens just off the entrance, with a custom designed, dark timber and glass fronted display cabinet. The bar area is completed with a welcoming white topped bar counter and high chairs. 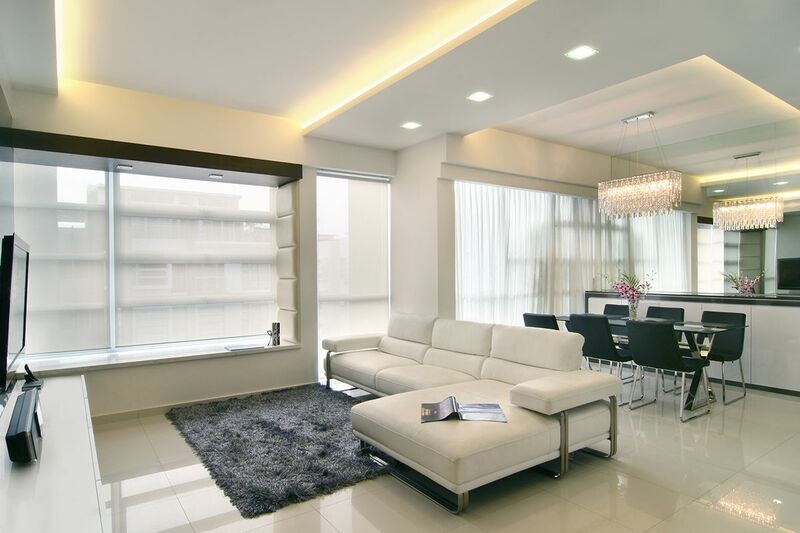 The glamorous dark tinted mirror reflects the whole scene adding to the sense of space. 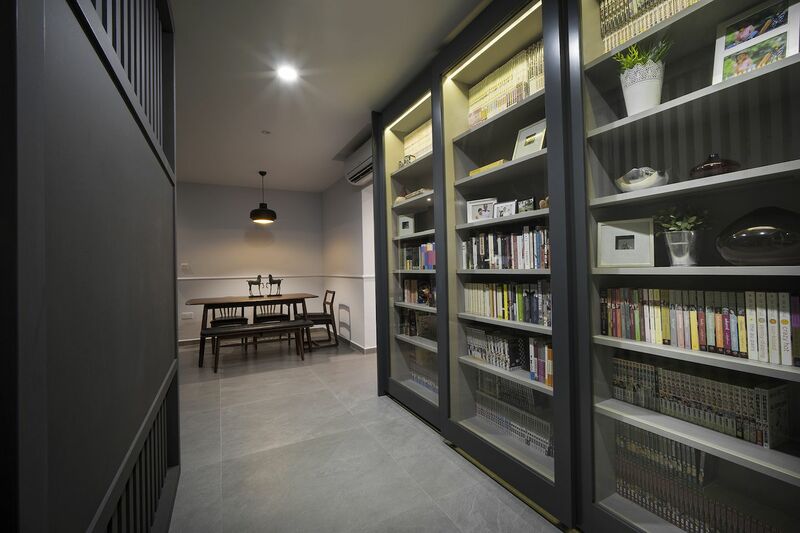 Our interior design company made low maintenance an important element of this interior design and thus the glass sliding doors of the bookshelves protect the books inside from dust. 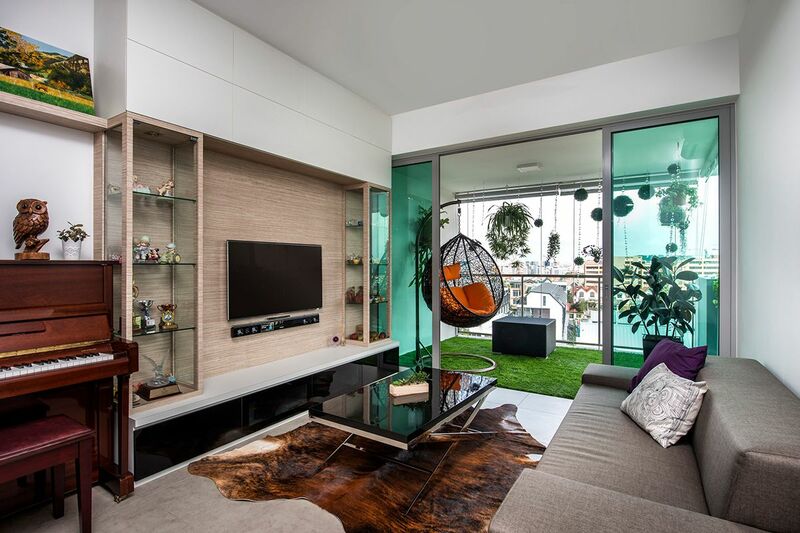 The extensive book collection is enhanced with the use of internal concealed lighting. 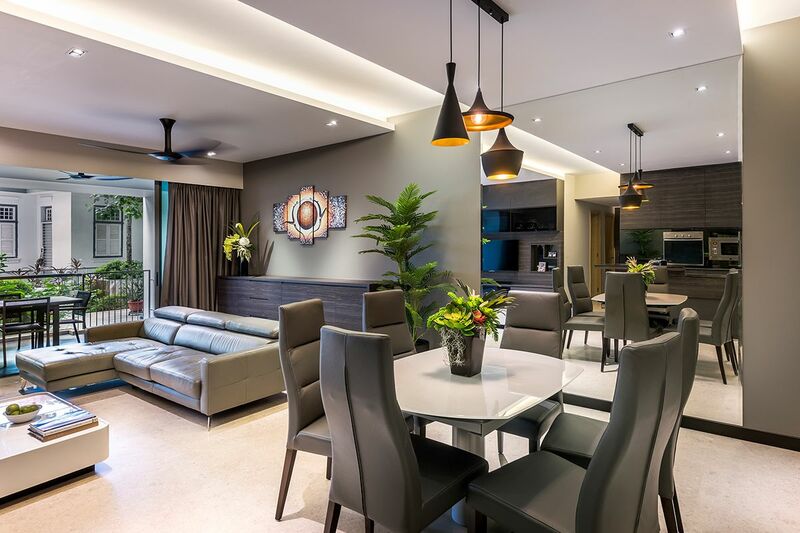 In another corner of the home, the dining area glows warmly under the light of its modern pendant lamp. 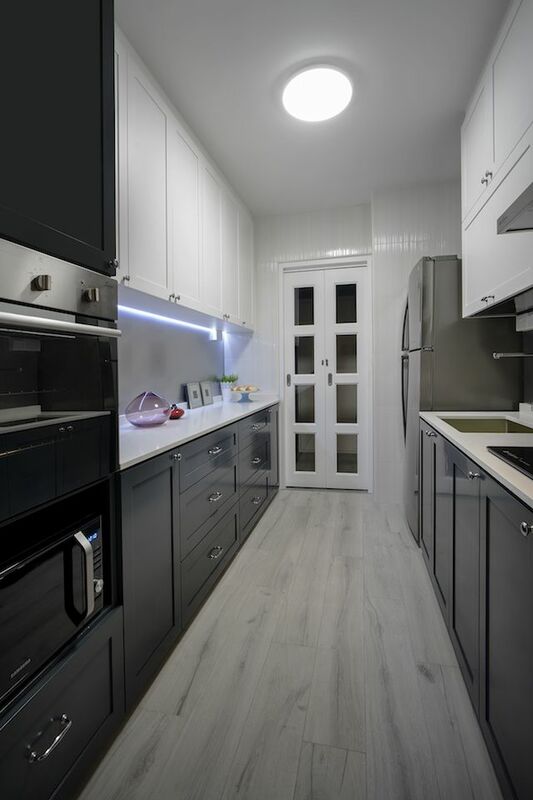 Though narrow, the galley kitchen manages to appear spacious with the effective use of dark cabinets below the marble counter top and white cabinets above, visually expanding the kitchen. 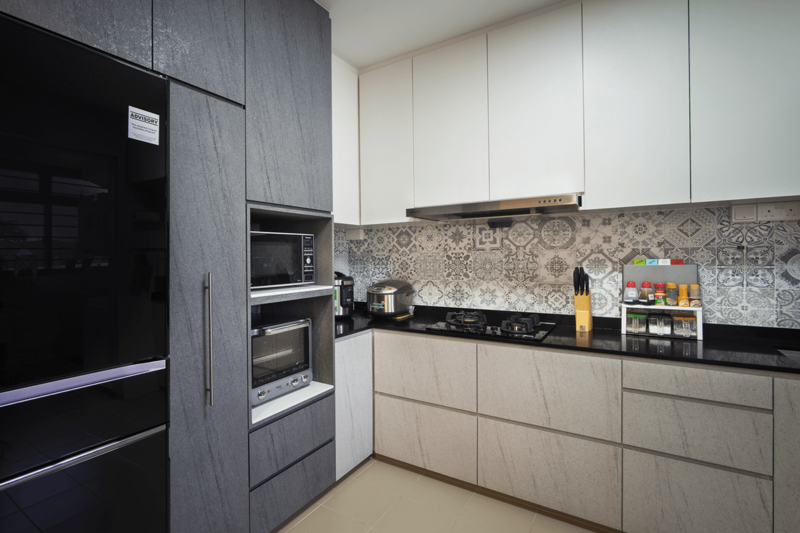 With all kitchen equipment and appliances well kept within the cabinet, the space is clean and streamlined without clutter. The walk-in wardrobe is every lady’s dream. Perfectly designed with full height cupboards with various sized compartments within, it enables storage to be effectively maximized and organized. 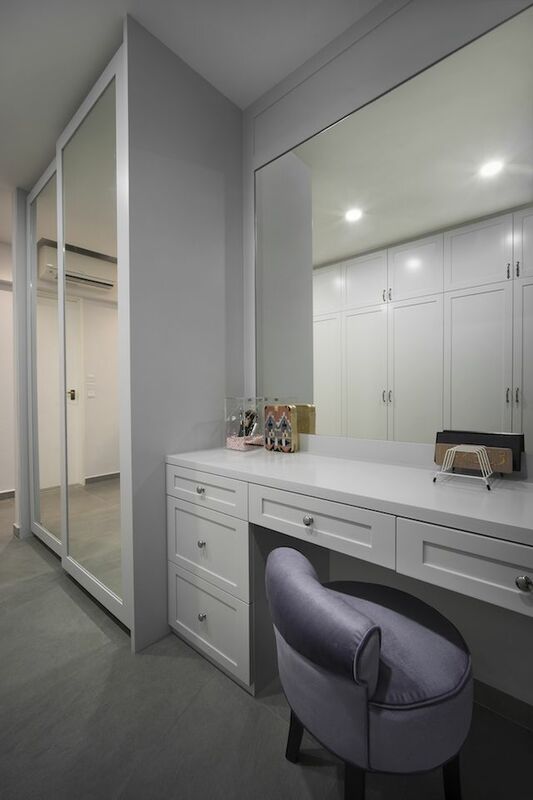 The walk-in wardrobe boats a large vanity paired with the lilac velvet chair, providing a feminine touch to the space. 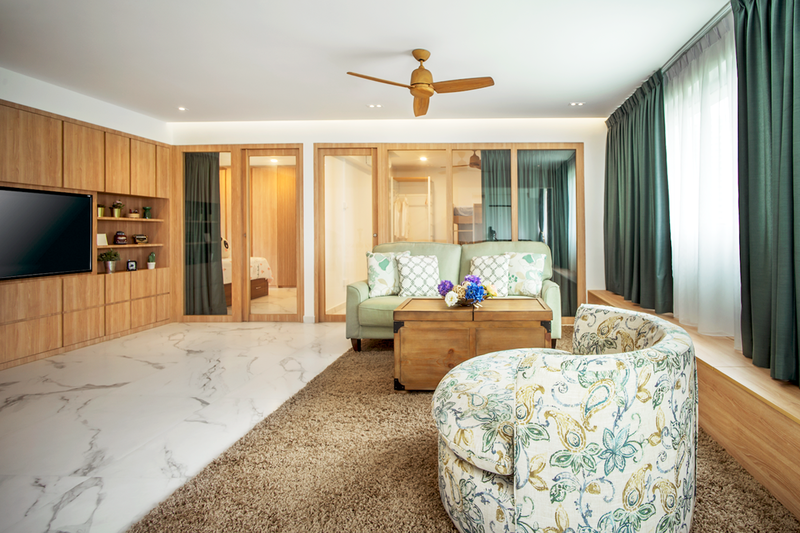 Mirrors on the sliding cupboard doors and on the wall allow for maximum visibility when dressing.